Folks often either love or hate grits. If you fall into the latter camp, perhaps this prepared polenta dish can help sway you otherwise. To avoid the search for a tube of prepared polenta, cook a batch of grits or cornmeal, pour the thick cereal grains into a loaf pan, and let them set before embarking on this recipe. 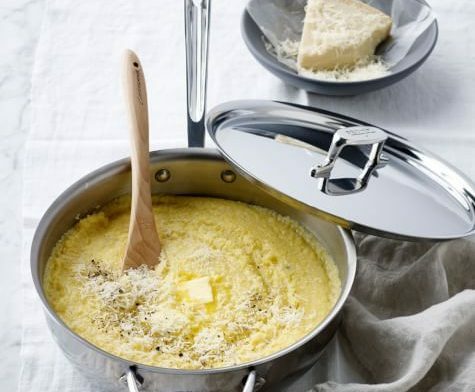 The heartiness of polenta/grits pairs nicely with spicy arugula and tangy balsamic vinegar and is especially delicious when topped with Parmesan cheese. Enjoy getting your grit on! Pre-heat the oven to 400°F. Grease a shallow 2-quart gratin dish or 9x13-inch baking pan with a little olive oil. Put 2 tablespoons of the oil in a large, deep skillet over medium-low heat. When hot, add the garlic and cook until soft, plump, and starting to color, about 10 mins. Turn off the heat and add arugula. Sprinkle with salt and pepper, toss gently once or twice. Cut polenta into ½ inch thick slices, sprinkle with salt and pepper. Carefully spread slices out on top of the arugula (overlap is fine). Drizzle with the remaining oil and sprinkle with the cheese. Bake until the topping is golden and bubbling, 20 to 25 mins. Serve topped with lots of black pepper.